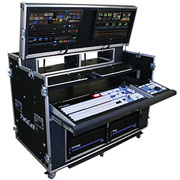 Mobile Studios' PortaCast Deluxe Flypacks are built with your choice of components from the best A/V equipment manufacturers including NewTek, Ross, Panasonic, FOR-A or Blackmagic-Design. The ultra powerful PortaCast Deluxe Integrated System features heavy duty ATA aircraft grade materials, shock-mount foam cushioning, a hinged lid housing dual 24″ LED monitors (Patent Pending) and ample rack-space for production gear. Can be used as a stand-alone production platform in a fixed studio or transported to remote locations for ultimate versatility. CALL MOBILE STUDIOS SALES - 561-372-0604 TO CONFIGURE AND PRICE A SYSTEM FOR YOUR SPECIFIC NEEDS AND BUDGET.